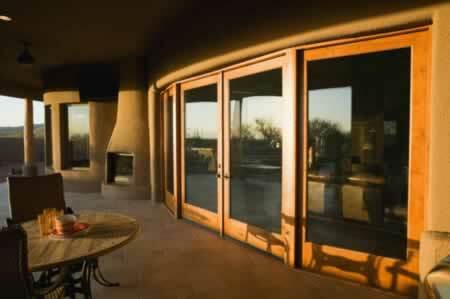 Patio windows and doors can be nightmares for energy-efficiency. The key to keeping utility bills down is to choose high-quality framing materials and double-pane or triple-pane glass in the door or window. The most common framing materials for storm windows and doors are vinyl, wood, and aluminum. Aluminum is flexible, easy to install and remove, and relatively inexpensive. However, it can easily warp, and it conducts heat, which can hinder your energy savings. Vinyl can look just like wood, but the colors can fade over time, especially if the vinyl is in direct sunlight every day. Vinyl can also crack in extreme temperatures, and a single crack means your storm windows or doors are no longer energy-efficient. Wood framing lasts for a long time, but does require regular maintenance to keep it attractive. It is also heavier than the other framing materials, and can be unwieldy when used for larger areas, such as patio doors.